If feels a little early to be writing about finishing the year, but I was recently reminded that life is short and time is precious. The end of the year can be such a full time, and without love and intention, we may find ourselves ringing in a new year after a blurry few months of snow flying, back to back holidays, excessive spending, and wondering where the time went. September is a great time to think about how we want to live out the rest of the year. 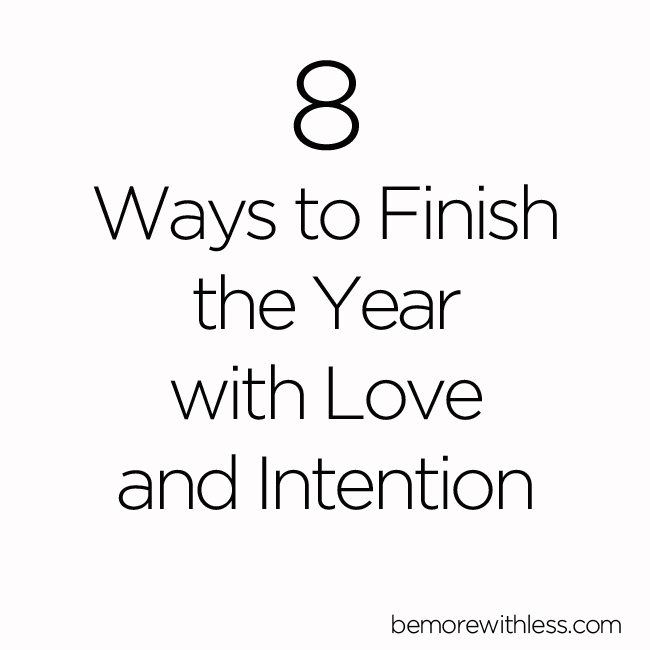 Instead of brushing off the next few months in hopes of a brighter new year, or a fresh start on January 1, love and intention reminds us that we don’t have to wait. Our time is now. 1. Start or Grow a Blog. I started this blog in 2010. Writing in this space has given me the opportunity to connect with you, be creative, and consider new ways to live and work. It’s given me the accountability and support to make big changes in my life, and the chance to inspire others with those changes. 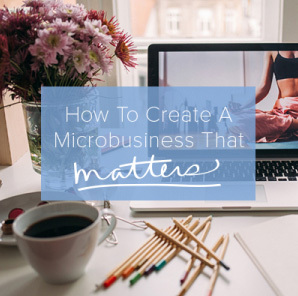 For extra info and inspiration, try my microcourse, How to Create a Microbusiness that Matters with a special bonus section on blogging. Treat yourself and others kindly. Wear a bracelet or necklace that reminds you to be gentle, kind, and loving. It could even be an elastic band around your wrist that pulls you back from daily busyness, stress, frustration, and worry, and reminds you to take a breath and smile. Most of our harsh thoughts and words can be avoided with an extra breath and smile. That’s just enough pause to connect with our hearts and choose a kind response instead of a quick reaction. 3. Volunteer locally or virtually. Soup kitchens and other organizations need us all year-long, not just over the holidays. Give your time, talents, and treasure to someone who needs it more than you. It will give back in ways you can not imagine. Give your mind a chance to recover from the onslaught of information your faced with when you open your computer or check your phone. If you don’t think it’s a problem, check out the comments on this post. Set rules for yourself like: no screen time after 7pm, or an hour off for every hour on. Unplugging weekly for at least 24 hours will contribute to creativity, better relationships, and overall mental and physical health. 5. Align your work and life with your strengths. I’ve never paid much attention to tests that assess your personality or strengths until this year. In March, I took the Via character strengths test. Learning my top strengths made it very clear to me why I was miserable in my sales and marketing career and thriving now. Writing here, sharing my appreciation of beauty on Instagram, creating books and courses, and sharing my story allows me to be completely aligned with who I really am. Knowing these strengths, I have great clarity about what matters most to me and how I can best serve myself and others. I notice when I am veering off course more quickly when I keep my top strengths in mind. Once you begin to know yourself and align with your actions with that understanding, your life and work will unfold with more ease. Maybe what you need for the rest of the year isn’t another project or goal. If you need rest, or a break to soothe your soul, try one of these books, or simply give your soul the time it needs to hang out with your heart. October 1 marks 7 years of minimalist fashion challenge Project 333. Give it a try. 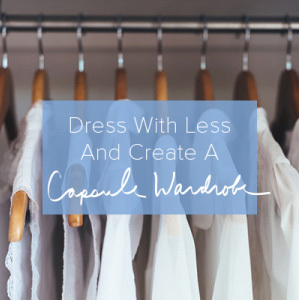 You’ll discover that this little wardrobe challenge will leave a mark on much more than your closet. Call someone you love. Buy coffee for the person behind you in line at the drive thru. Share someone’s work. Make sandwiches for hungry people. Write a thank you note or text someone right now, “I love you.” You can turn someone’s day around with a simple demonstration of love and kindness. If you only did that twice a week for the rest of the year, you could lift more than 30 people. It’s not too late for us. The year will be over before we know it. Let’s create a strong foundation for the new year by living the rest of this year with love and intention. 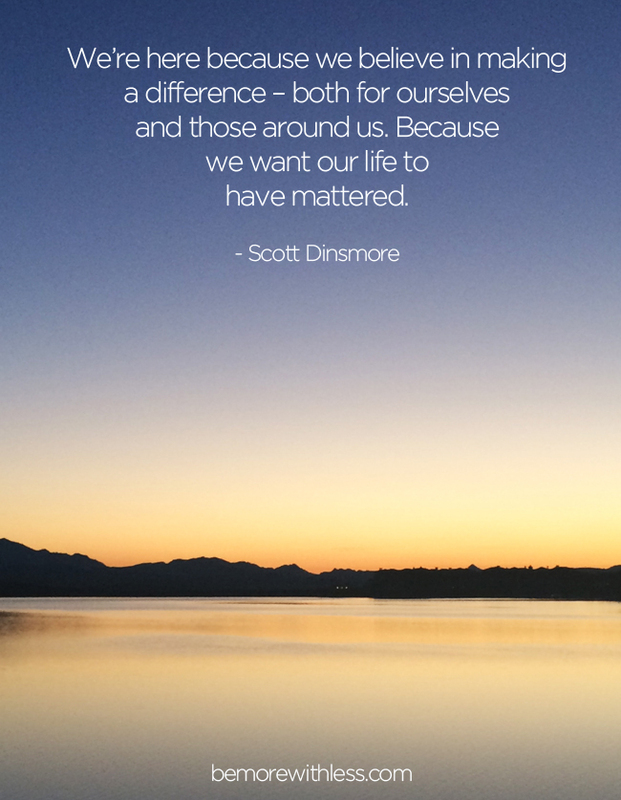 Let’s choose to make a difference for ourselves and those around us. It’s our gift and responsibility to live fully and to help others to do the same. Great post!! I was just thinking about how this time of year always flies by to the end of the year and how I can make the most out of the rest of the year. I’m thinking about purchasing your blog course. I’ve been wanting to start a blog for 3 years and need to just do it. One question: how much money upfront would you estimate it costs to set up the web host and other services, such as feed burner? Thanks. You can start a blog hosted on WordPress or another platform for free, but I do recommend self hosting which is usually less than $100 per year. Feedburner is free as is Mailchimp up to 2000 subscribers. Now is the perfect time to start thinking about the end of the year, because we all know how time somehow speeds up during the holiday season. I’ve started clearing my calendar of everything non-essential and have put up filters so I’m more choosy about what I say yes to, to insure there’s plenty of room for both the things I can’t avoid and the things I really, really want to do! I took your blogging course and it was awesome! It helped me I started my blog 2 years ago. I still use many of the nuggets when writing my posts. Thank you for your encouragement and mentorship. Will Zero to 100 remain on Amazon.com? Hi Kelvin, I am going to discontinue it completely from my site and Amazon. Thanks for asking! I’ve been feeling malcontent lately; took the VIA quiz from your link. My #4 was kindness, and that reminded me that I do want to be kind. It’s one of my “strength words.” Thanks always for your thoughts. I have always felt that the New Year should begin with Fall, in September. The New Year that everyone celebrates is too close to other holidays. I love Fall and the cooler temperatures, and I will celebrate my New Year on Sept. 23. Thank you for posting this now; it is the perfect time! Brilliant tips, I’ll do all of this! You’re a genius and the most beautiful soul. I’m a big fan haha sorry. I’m really grateful for all your posts and blog in general. 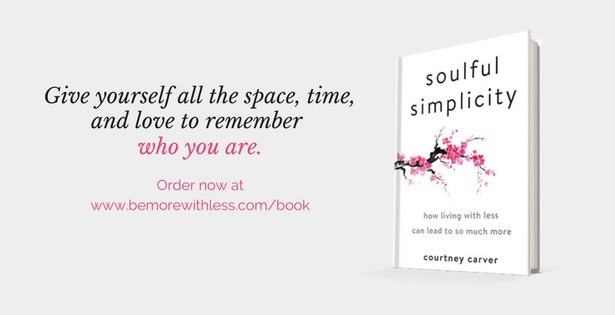 Such a beautiful reminder, Courtney! It’s definitely not too late for us! Making the shift from achieving and acquiring to meaningful contribution, distraction to connection, fear to love…so much wisdom in this post Courtney. I’m a Christian but I consider this time of the year (Feast of Trumpets to Yom Kippur) to be a “2nd chance” New Year. I spend time reflecting past 9 months whether I did what God wanted and how to course correct for the future. I spend more time Bible reading, pondering, listening, praising than usual. By nature, I’m not a reflective person, but I set this time apart. Just purchased your course. I had been thinking of starting a blog but never did. Your website is so inspirational to me that I’ve decided to give it a try. You are helping me to redefine my goals and the way I spend my time and energy. Thank you so much for sharing your experience with us. You’re amazing. Thank you for such a beautiful and inspiring post. Great tips, Courtney, and the timing couldn’t be better – as always, fall just seems to fly by. It’s so easy to get distracted and lose sense of direction. This post is a great reminder for me that now is the time to do those things that are important to me. Preach! I love this and it was just what I needed to read. I always get to the end of the year thinking about what time I may have wasted. This is such a great check-in. There are still 3.5 months, what am I going to do with them. And how can they bring me even more happiness + peace in 2016. Love this! Any suggestions to help adult children with the idea that their parents are downsizing and selling the family home?